Originates in Newark, NJ, in 1978, when Shiva Ayyadurai, a 14-year old, dark-skinned, lower-caste, Indian immigrant boy, working at the University of Medicine and Dentistry New Jersey wrote over 50,000 lines of code to invent the world's first full-scale electronic emulation of the interoffice, inter-organizational mail system consisting of: Inbox, Outbox, Folders, the Memo, Attachments, etc., naming the program "email," defining email as we all experience today, for which he received the first Copyright for "Email," in 1982, from the United States government, officially recognizing him as the inventor of email. Picture of 14-year-old V.A. Shiva Ayyadurai with "email"
computer program code, from 1978, in the background. "The efforts to belittle the innovation of a 14-year-old child should lead to reflection on the larger story of how power is gained, maintained, and expanded, and the need to encourage, not undermine, the capacities for creative inquiry that are widely shared and could flourish, if recognized and given the support they deserve. The angry reaction to the news of his invention of EMAIL and the steps taken to belittle the achievement are most unfortunate. They suggest an effort to dismiss the fact that innovation can take place by anyone, in any place, at any time. And they highlight the need to ensure that innovation must not be monopolized by those with power — power which, incidentally, is substantially a public gift." 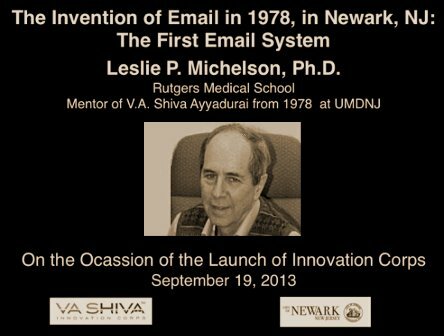 Leslie P. Michelson on Invention of Email by Shiva Ayyadurai. 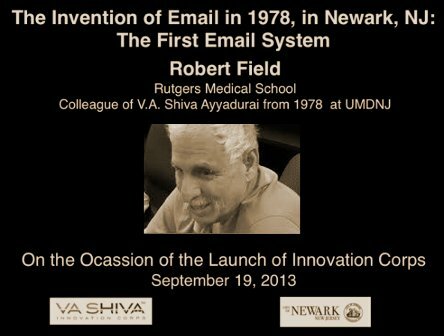 Robert Field Discusses Email’s Invention by Shiva Ayyadurai. I. Introduction: Leslie P. Michelson, Ph.D.
III. The Invention of Email – Leslie P. Michelson, Ph.D.
V. The Five Myths About Email's History – Deborah J. Nightingale, Ph.D.
VI. The Future of Email – V.A. Shiva Ayyadurai, Ph.D.
On August 30, 1982, V.A. Shiva Ayyadurai received official recognition as the inventor of email from the U.S. government for his 1978 invention. now in the Smithsonian Institution National Museum of American History (NMAH). At the time of Shiva’s invention of email in 1978, the Copyright Act of 1976 did not allow for the protection of software inventions. Only in 1980 was the Copyright Act of 1976 amended to protect software. This resulted in the Software Act of 1980. 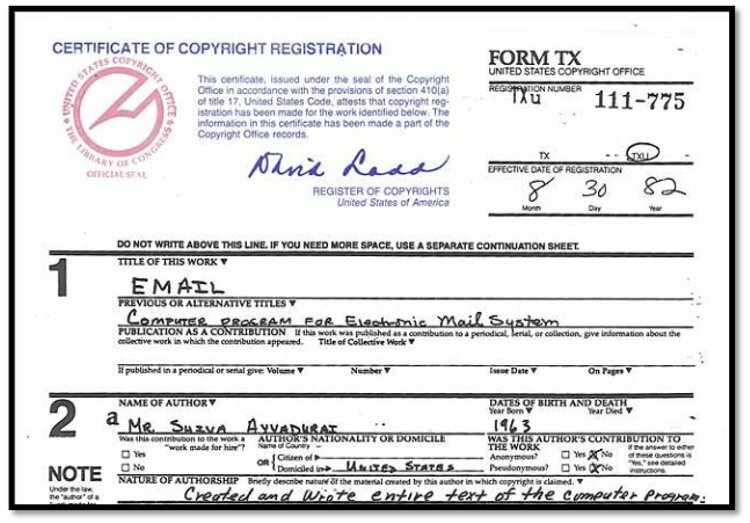 In 1981, Shiva applied for the Copyright as per the Software Act of 1980. On August 30, 1982, Shiva was issued the first Copyright for “Email”, “Computer Program for Electronic Mail System”. To celebrate the Anniversary of Email in 2014, the History of Email Series was launched. Larry Weber, a legend and pioneer in both traditional and social media, an acclaimed author of five bestselling books on media, will start the series with The Boy Who Invented Email, sharing the ecosystem that enabled a 14-year-old boy to invent email. In the Invention of Email, I will share my recollections of Shiva and the conditions in which we met him and how he invented email. Robert Field, one of Shiva’s colleagues at UMDNJ, in 1978, provides his recollections in The First Email System. Dr. Deborah J. Nightingale, a world-renowned system scientist, provides a detailed analysis based on her painstaking efforts to uncover the The Five Myths About Email’s History that have been the source of much vitriol from those who wish to deny email’s true history. Dr. V.A. Shiva Ayyadurai, Ph.D., the inventor of email, will share his thoughts on The Future of Email and the challenges for the public to ensure that email remains truly FREE. Finally, we have added an Epilogue, updated as of September 11, 2014, which provides journalists as well as the public a concrete analysis to understand the Attempts to Hijack the History of Email. V.A. 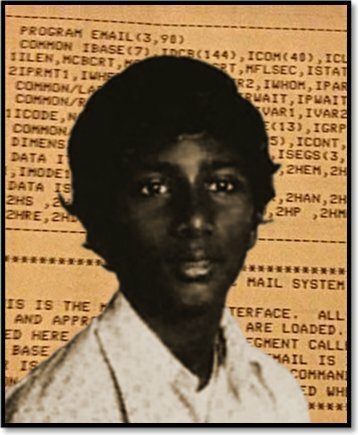 Shiva Ayyadurai, the Indian American who invented email as a 14 year-old kid. Shiva neither sought nor received any fame or fortune for his invention. 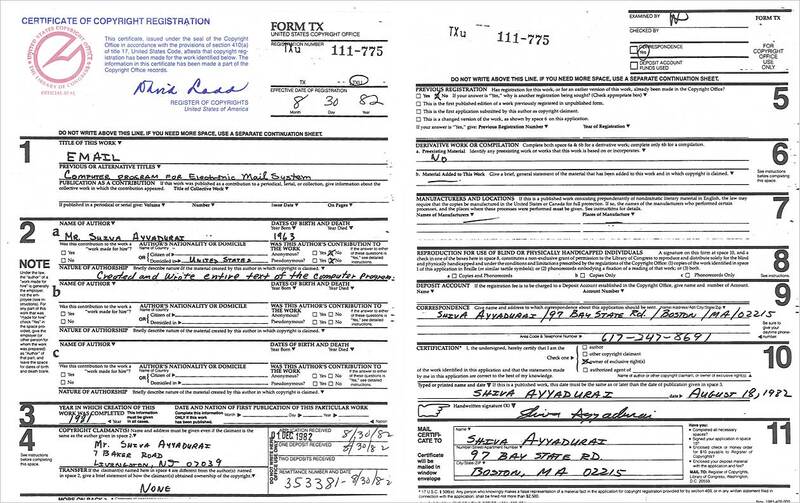 In 2012, over thirty year later, the Smithsonian requested for and acquired his computer code, papers and artifacts documenting his invention for the National Museum of American History (NMAH). When news of the acquisition went public, Shiva was viciously attacked, defamed with a clear and malicious intent to destroy his character, career, and reputation as an inventor and scientist. Who Are Behind the Efforts to Hijack the History of Email? This historical series will reveal that it was a group of industry insiders, former employees, alumni and partners loyal to Raytheon/BBN, and the ARPANET coterie, along with SIGCIS, a cabal of “historians”, who for nearly 30 years, had created a revisionist history of email’s origin, for nearly three decades to hijack the boy’s invention of email. Their motive was to not only to protect Raytheon/BBN’s multi-billion dollar brand as the “inventors of email”, which gave them an unfair advantage in the competitive cyber-security market against Northrup-Grumman and General Dynamics, but also to monopolize and perpetuate a false and deplorable narrative that innovation could only occur within the bastions of big companies like Raytheon, large universities such as MIT and the military such as the ARPANET. The documented evidence, now in the Smithsonian, exposed the false history of email that these insiders had fabricated and perpetuated over the past thirty years. — Crocker, David. Framework and Function of the "MS" Personal Message System. Santa Monica, CA: RAND Corporation, December 1977.
was released on the site, Shiva’s detractors began to throw tantrums, escalating their defamation and attacks on Shiva as well as his colleagues including threats as well as stating this entire effort was a PR effort based on him being self-promotional. In 1978, Shiva had done the “impossible” by emulating the “full-scale, inter-organizational mail system”, which he named “email”, a term never used before, thus defining email, as we all know and use today, and for which he was the first to receive formal recognition by the US Government for its invention. However, in the age of online rags and tabloids, where media properties struggle to get ephemeral viewers, where sensationalism can obfuscate the truth, the origin of email became confused by the deliberate work of those industry insiders. To commemorate the Anniversary of Email on August 30, it is time the world knows the real struggle that a 14-year-old boy endured and what he gave to the world. His story is not just about the invention of email, but more about who owns and controls innovation, and what that means for all of us. 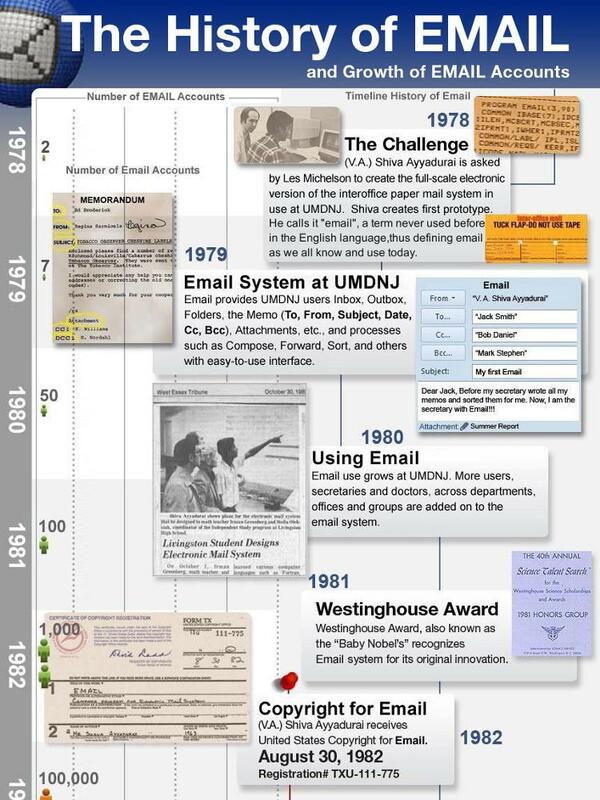 Welcome to the History of Email. Celebrate August 30th, the Anniversary of Email! Leslie P. Michelson, Ph.D. is the Director of High Performance and Research Computing Division, Rutgers Medical School (RMS). In 1975, the University of Medicine and Dentistry of New Jersey (UMDNJ), now a part of RMS, recruited Dr. Michelson, a trained theoretical physicist from Brookhaven National Laboratories. His group at RMS develops solutions in the life sciences for research endeavors with demanding computational requirements. In the late 1970’s Michelson’s organization provided the challenge, resources and mentorship that led to the development of the first electronic interoffice memorandum postal system by V.A. Shiva Ayyadurai. Throughout his career Michelson has been active in the support of the use of networking technologies to advance research and education interests in the State of New Jersey. He was a founder and served as the third president of the New Jersey Intercampus Network, the predecessor of the State’s Higher Education and Research Network, NJEDge.Net. Introduction: Leslie P. Michelson, Ph.D. The Invention of Email – Leslie P. Michelson, Ph.D. The Five Myths About Email's History – Deborah J. Nightingale, Ph.D. The Future of Email – V.A. Shiva Ayyadurai, Ph.D.